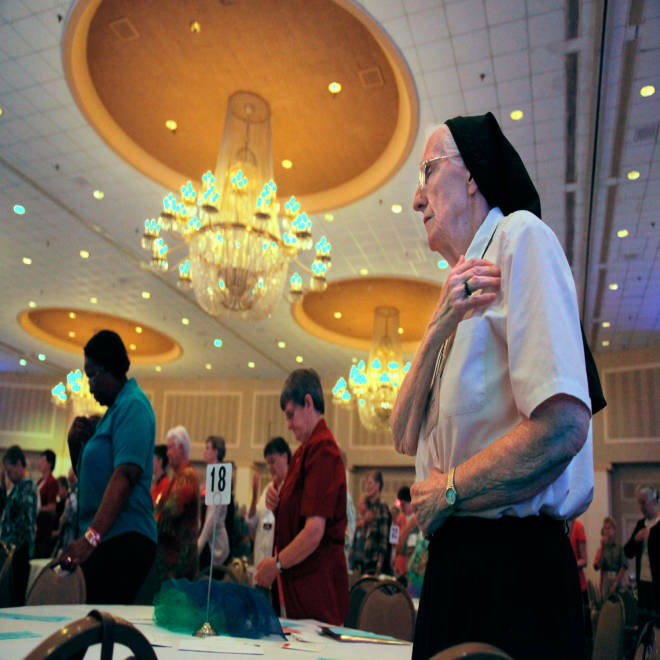 Sister Mary Rose Crowley, from Windsor, Conn., makes the sign of the cross at the end of a morning Mass on the opening day of the Leadership Conference of Women Religious, the largest group of Catholic nuns in the United States, in St. Louis, Mo. More than 900 Roman Catholic nuns gathering in St. Louis, Mo., this week to discuss the future of their relationship with the Vatican were surprised to be greeted by supporters with a simple message on their signs: "We're with you, sisters." "It's utterly amazing to all of us, really," Sister Annmarie Sanders, director of communications for the Leadership Conference of Women Religious, told NBC News. "They're having vigils every night," she added. "We've received... I think it's almost 1,500 letters that have been collected so they can distribute them to our members -- all letters of support." The Leadership Conference, which represents about 80 percent of the 57,000 nuns in the United States, is holding its yearly national assembly this week following scathing criticism from the Vatican of the nuns' alleged lack of fidelity to Catholic teachings. Their supporters say they were shocked by the crackdown. "Our phones were ringing off the hook at our organization," Erin Saiz Hanna, spokesperson for the Nun Justice Project and executive director of the Women’s Ordination Conference, told NBC News. "Our members were just outraged, they wanted something to do." 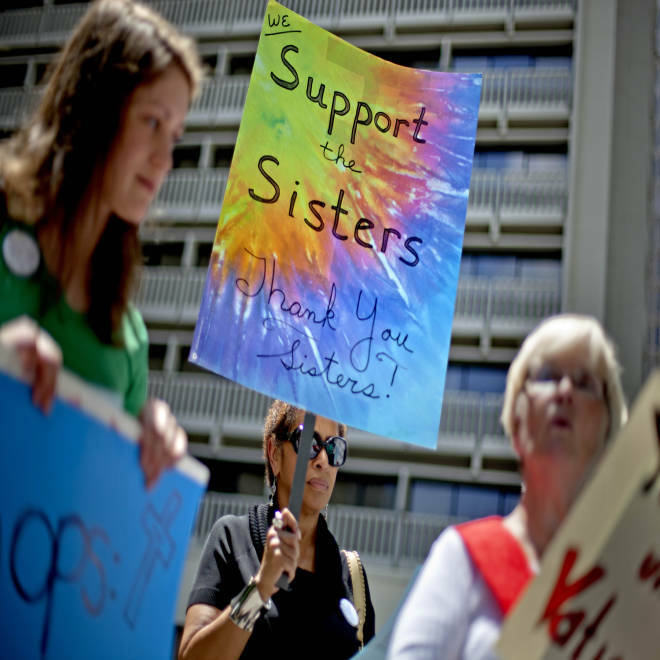 The Nun Justice Project, a grassroots coalition of Catholic organizations, started the day after the Vatican released its mandate as a petition created on Change.org. "The goal was to have 57,000 signers on the petition -- one name for every sister in the U.S. -- and we surpassed that," Hanna said. The group delivered the petition to the United States Conference of Catholic Bishops. 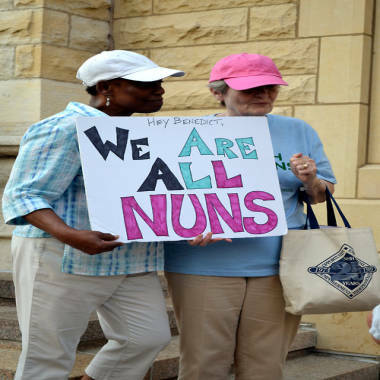 Two women march in support of Catholic nuns in Chicago in August 2012. Another concern voiced by the Vatican relates to conferences organized by the nuns featuring "a prevalence of certain radical feminist themes incompatible with the Catholic faith." Since then, the Nun Justice Project has organized more than 100 vigils across the country, 37 of which took place Tuesday night. At one vigil, Hanna said, someone had driven two and a half hours just to spend two hours supporting the sisters. "I've been blown away by the support," said Hanna, who is also an associate with the Sisters of Mercy and says nuns have been her role models in life. "People really relate to the sisters." The coalition also asked American Catholics to redirect their annual Peter's Pence contributions from the Vatican to their local communities of women religious. "We were able to redirect $100,000 from that Peter's Pence," Hanna said. "People were able to choose the community that they wanted to redirect their funds to." This week, the nuns will pray together and discuss a range of options for the future, from accepting the Vatican's mandate to starting a new organization independent of the church's control. Sanders said the nuns are expected to announce their decision at a press conference Friday afternoon. No matter what the women religious decide in St. Louis, Hanna says she believes a new Catholic Church is being formed. "People are really with the sisters here, they look to their leadership and they model the leadership that they want to see in our church," she said. "I think people just have a lot of hope in the sisters right now." Jim FitzGerald, executive director of the Catholic organization Call To Action, which is also part of the Nun Justice Project, told NBC News there is a growing disconnect between the Vatican and the nuns. "It's really two different world views," he said. "It's the Vatican, that is very concerned with how Catholics follow rules and you have the perspective from the women religious and how they live out the gospel values." A vigil is planned for Thursday night in St. Louis, and the nuns will try to be present to greet their supporters. "We are a faith where we believe that with God all things are possible," FitzGerald said, "and I would like to think that those who are seeing the incredible support around the country for the sisters would be moved by that support and be a little more reflective about their actions."